Searching for Designer Cakes Brighton? Flair 4 Cakes Ltd are cake decorators based in Brighton, East Sussex. James and I would like to say a massive thank you for doing our wedding cake. We had a lot of compliments and it turned out beautifully. The cake was fantastic, so thank you very much. Flair4Cakes Ltd are cake decorators and cake makers based in Brighton, East Sussex. We specialise in custom cakes and cupcakes for all occasions, whether a birthday cake or wedding cake. Our reputation, experience and techniques enable us to create the perfect cake for you and all our cakes are custom-designed to suit your individual needs. The cake design you choose will make a statement to express your personality and style, to reflect your individual taste, to fit well with the location, décor and ambience which you have created for your reception. We will then enhance this design to create a masterpiece for you. Every cake is freshly baked using the finest natural ingredients available in a choice of vanilla, lemon, chocolate, carrot and coffee sponges or fruit cake. 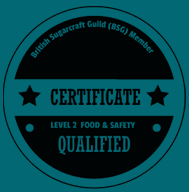 Gluten-free, diabetic or eggless cakes are also available to suit special dietary requirements. Fillings for sponges vary from butter cream, chocolate, coffee, lemon curd or any filling of your choice.